Leaders in today’s healthcare environment have to be ready for rapid change on numerous fronts. With those challenges in mind, leaders in the osteopathic profession assembled in Tampa during January for the AOA’s Advocacy For Healthy Partnerships conference. AKOMA was represented at the gathering by President Nancy Kragt, DO. Designed for physicians in the osteopathic profession, the AHP Conference featured a series of training sessions covering a diverse range of knowledge and skills to aid leaders in the field of Osteopathic Medicine. Attendees received expert advice on successfully advocating for patients and engaged in discussion on topics such as grassroots advocacy, emerging issues in health policies, and technological innovation. The event included a discussion on resilient leadership with Lt. General Russel L. Honoré (US Army – Ret.) commander of the joint task force responsible for coordinating military relief efforts for Hurricane Katrina-affected areas. The leaders in attendance also heard from Mark Kelly, retired American astronaut, engineer and U.S. Navy Captain. Kelly told the group to think independently and question conventional wisdom. “None of us is as dumb as all of us,” Kelly said. Dr. Kragt said she received an abundance of information to bring back to her colleagues and practice in Alaska. 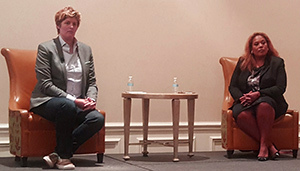 CNN Commentators Sally Kohn (left) and Tara Setmayer appeared at AHP to lead a spirited discussion about access to affordable healthcare in the United States. Dr. Kragt said she had been inspired to inquire about new innovations and technology within the healthcare industry. Header images via Creative Commons. Each image copyright © its respective photographer.